For the second year in a row, a thrown-together team called the Idaho Internationals won the Paul Scherer Invitational Men's Division 2 soccer tournament last weekend in Boise, beating the Boise Internationals in the finals 2-0. 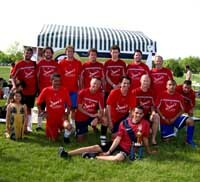 The Wood River Valley-based Internationals went undefeated in the June 3-5 Southern Idaho Soccer League (SISL) Adult Invitational tourney, beating the same Boise Internationals in group play 4-1, Chi Thai Ming Restaurant 3-0, NG United 3-1 and finally the Boise Internationals for a second time winning 2-0. Leading a steady and balanced offensive effort was Chris Ward (4 goals) followed by Spencer Flade (2 goals) and five other players with one apiece—Adam Tanous, Ciro Lima, William Silva, Rian Timmons and Hector Lopez Sr.
"Man of the Tournament" went to goalkeeper Hector Romero Lopez Jr. He allowed only two goals in four games. He saved his best two games for the semi-finals and finals. Romero-Lopez made several spectacular saves in those games, two on his goal line. Helping Romero-Lopez in a fine team defensive effort were Casey Finegan, Ben Stahl, David Anderson, Juan Sanchez, Jose Aramas, Charles Friedman and captain Kenny Morrell. They turned away many threats by opponents. The midfield efforts of the father-and-son duo of John and Ryon Campbell also played big roles in the outcome. John distributed the ball effectively and had multiple assists. Ryon dominated the middle on the ground and in the air. With the team missing several key players Sunday for the semi-final and final games, Morrell noted, "We had to really pull together and play as a team, and we did. It was nice to repeat and show Boise that the Wood River's got game." Last weekend's Scherer Invitational didn't go as well for the valley-based F.C. Real Revolucion squad, playing some higher-level competition in the eight-team Men's Premier bracket. In all, there were 24 men's teams and 16 women's for the weekend. With only 11 players and no substitutes, F.C. Real Revolucion lost to Twin Falls 2-1 in a hard-fought contest, fell 6-1 to F.C. Boise United and tied Jackson Hole (Wyo.) 2-2. Against Twin Falls, midfielder Alberto Vazquez scored off a beautiful header with an assist by midfielder Enrique Hurtado on a free kick. The only Revolucion goal against Boise came from midfielder Jorge Gomez. The third and final game for Revolucion was a much better effort. Young, 15-year-old forward Jose Ortiz scored early in the game off a cross from Hurtado. Revolucion fell behind 2-1 but Gomez came up with his second goal of the tournament for the 2-2 tie. Intensity from both teams resulted in many scoring tries as the game wound down. Rounding out the Revolucion roster were goalkeeper Eric Valencia, defender Juan Ortiz, midfielder/defender Alejandro Reveles, defenders Alberto Salinas and Daniel Vargas, defender Freddy Tamayo and midfielders Benjamin Murrillo and Enrique Salinas.